New Zealand‘s rules on police use of force generally comply with international standards. New Zealand's constitution is not found in one document. although the 1986 Constitution Act sets out the roles of the executive, the legislature, and the judiciary in New Zealand's system of government. The 1975 Treaty of Waitangi is also a foundational document for New Zealand,The Treaty is the agreement signed by representatives of the Queen of England and leaders of most Māori Tribes when Britain first claimed New Zealand as a colony in 1840.but is supplemented by the 1975 Ombudsmen Act, the 1990 New Zealand Bill of Rights Act, and the 1993 Human Rights Act. Under the 1990 New Zealand Bill of Rights Act,S. 8, 1990 New Zealand Bill of Rights Act. It is further stipulated that:S. 9, 1990 New Zealand Bill of Rights Act. 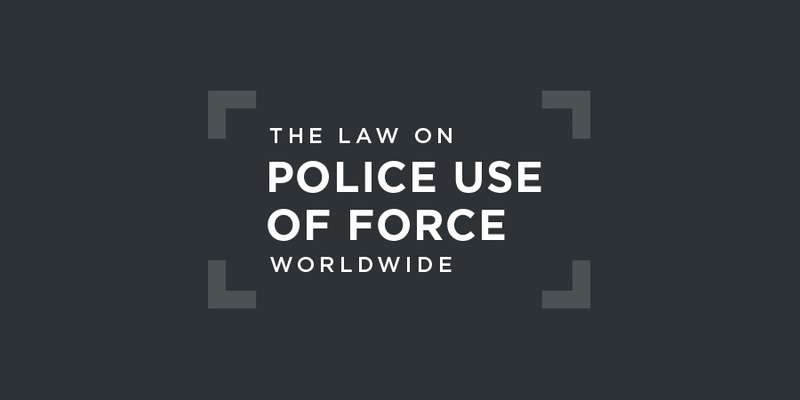 The use of force by New Zealand Police is generally regulated by the 1961 Crimes Act. It allows "such force as may be necessary to overcome any force used" in resisting arrest, unless the arrest can be made "by reasonable means in a less violent manner".S. 39, 1961 Crimes Act.Under Section 62 of the 1961 Act, a police officer is criminally liable for any excessive force he or she uses. such flight or escape cannot reasonably be prevented in a less violent manner. Where practical, the police should not use a firearm unless it can be done without endangering other persons. (a) MARK the position of the member, empty cartridge case, bullet fragments, injured or deceased persons, or any other items or persons associated with the discharge. (b) PRESERVE the cartridge case and where possible the bullet or bullet fragments. (c) SECURE the firearm and remaining rounds. (d) ADVISE the member's immediate supervisor who shall promptly advise the District Commander. (ii) in the case of active or passive resistance to a lawful order. (2) An officer or staff member who uses physical force for any of the purposes or in any of the circumstances referred to in subsection (1) may not use any more physical force than is reasonably necessary in the circumstances. The Independent Police Conduct Authority (IPCA), established by the 1988 Independent Police Conduct Authority Act, handles complaints about the New Zealand Police. This includes investigating and resolving complaints concerning alleged misconduct or neglect of duty by, or concerning, the practices, policies, or procedures of, the Police and investigating incidents where the New Zealand Police may have caused death or serious bodily harm in the course of carrying out their duties. In January 2018, the media reported that 887 police officers were accused of using excessive force or assault In 2015-2017, but that just nine were charged and only one convicted. Under the 1975 Ombudsmen Act, the national Ombudsman investigates complaints about the acts and decisions of government agencies, including the Department of Corrections, which is responsible or prisons in New Zealand. In 2016, in its examination of New Zealand's sixth periodic report the Human Rights Committee noted "statements by State officials suggesting an 'unconscious bias' in police operations towards Māori" and was "concerned about allegations of racial profiling involving Māori and persons of African descent".Human Rights Committee, Concluding Observations on New Zealand's sixth periodic report, UN doc. CCPR/C/NZL/CO/6, 28 April 2016, §23.It recommended that New ZealandHuman Rights Committee, Concluding Observations on New Zealand's sixth periodic report, UN doc. CCPR/C/NZL/CO/6, 28 April 2016, §24. undertake a comprehensive review of law enforcement operational policies in order to ensure their conformity with human rights principles, including the prohibition of discrimination, and to evaluate their impact on indigenous peoples. The State party should also provide training to law enforcement officials in order to sensitize them to the need to conduct themselves in a way that does not lead, even unintentionally, to acts of racial profiling. With respect to custodial settings, the Committee remained "concerned about the negative impact of the State party’s prison privatization policies on the effective management of prisons and on the respect and promotion of the rights of detainees".Human Rights Committee, Concluding Observations on New Zealand's sixth periodic report, UN doc. CCPR/C/NZL/CO/6, 28 April 2016, §41.It recommended that New ZealandHuman Rights Committee, Concluding Observations on New Zealand's sixth periodic report, UN doc. CCPR/C/NZL/CO/6, 28 April 2016, §42. take all appropriate measures to ensure that the human rights of persons deprived of their liberty are respected and protected in all places of deprivation of liberty, including private penitentiary institutions, in line with the established international standards, including the revised United Nations Standard Minimum Rules for the Treatment of Prisoners (the Nelson Mandela Rules). The State party should also provide adequate human and financial resources to the Office of the Ombudsman to enable it to discharge its monitoring and reporting mandate effectively. In 2015, the Committee against Torture noted that the Independent Police Conduct Authority had not received sufficient resources and that the number of staff was inadequate to enable it to fulfil its mandate.Committee against Torture, Concluding observations on the sixth periodic report of New Zealand, UN doc. CAT/C/NZL/CO/6, 2 June 2015, §9.The Committee did not believe that the mandate of the Independent Police Conduct Authority allowed the institution "to fully investigate and initiate the prosecution of perpetrators. "Committee against Torture, Concluding observations on the sixth periodic report of New Zealand, UN doc. CAT/C/NZL/CO/6, 2 June 2015, §9.The Committee was "also concerned that the law leaves it up to the police to initiate investigations on itself, which raises questions about the independence of such investigations." It called on New Zealand toCommittee against Torture, Concluding observations on the sixth periodic report of New Zealand, UN doc. CAT/C/NZL/CO/6, 2 June 2015, §10. ensure that the Independent Police Conduct Authority is equipped with a broader mandate and full independence in order to investigate promptly, effectively and impartially all reports of violence. In particular, such investigations should not be undertaken by or under the authority of the police or military, but by an independent body. ensure that electrical-discharge weapons are used exclusively in extreme and limited situations, where there is a real and immediate threat to life or risk of serious injury, as a substitute for lethal weapons and by trained law enforcement personnel only. The State party should revise the regulations governing the use of such weapons with a view to establishing a high threshold for their use and expressly prohibit their use on children and pregnant women. The Committee is of the view that electrical-discharge weapons should not form part of the equipment of custodial staff in places of deprivation of liberty. The Committee recommends that the State party provide more stringent instructions to law enforcement personnel authorized to use electric-discharge weapons and to strictly monitor and supervise their use through mandatory reporting and reviews. In its 1991 judgment of R v. Thomas, the Court of Appeal found that self-defence is available to a defendant who holds an honest, albeit mistaken, belief that the police are using excessive or unlawful force, and uses reasonable force against the police in response.R v. Thomas  3 NZLR 141 (CA) at 144.In its 2015 judgment in Stepanicic v. R, the Court of Appeal supported the reasoning in Thomas and held that in directing a jury, a trial judgeCourt of Appeal, Stepanicic v. R, CA242/2014  NZCA 35.
should explain that “excessive force” means “more force than is necessary to overcome any force used by the defendant in resisting arrest”. This wording is adapted from the Crimes Act, s 39, and was applied in Beagle v. Attorney-General, where the police used force on a very slight man (the Judge described him as a “flyweight”) ... such that he sustained injuries requiring hospitalisation. ... The Court considered the police treatment was “over-vigorous” and “wholly unnecessary” given Mr Beagle was not violent and the constables involved were “much bigger and unquestionably stronger” than he was. In most instances in recent years, the Independent Police Conduct Authority has found that police shootings were justified. In the non-fatal shooting of Mr X in 2014, police fired a total of seven rounds at an armed suspect. In 2017, the Authority published its report, concluding that it wasIndependent Police Conduct Authority, "Non-fatal Police shooting of Mr X in Kerepehi", Report, 20 April 2017, §§106, 107.
satisfied that Officers F and G believed that Mr X posed an immediate threat of death or grievous bodily harm to Ms Z and to Police. Officers F and G knew that Mr X had previous firearm offences and had threatened to “go for a shootout” if he saw Police. Officer F challenged Mr X several times informing him that he was armed and that Mr X should put the gun down and put his hands in the air. Instead, Mr X continued to work the bolt on his firearm and aimed his weapon at Police. In relation to a case involving the use of conducted electrical weapons against an arrestee (Mr X) held in a police station, the Independent Police Conduct Authority recalled thatIPCA, "Use of Taser following arrest in Auckland", Report, 9 March 2017, §64. Police policy states that a Taser may only be used to arrest an offender if the officer believes the offender poses a risk of physical injury and the arrest cannot be effected less forcefully. A Taser must only be used on a person who is assaultive (defined as “actively hostile behaviour accompanied by physical actions or intent, expressed either verbally and/or through body language, to cause physical harm”) and cannot be used on a person who uses passive resistance in relation to Police. The Authority further recalled that: "Police policy expressly states that a Taser should never be used against an uncooperative but non-aggressive person to induce compliance. "IPCA, "Use of Taser following arrest in Auckland", Report, 9 March 2017, §65. In the Authority’s view,IPCA, "Use of Taser following arrest in Auckland", Report, 9 March 2017, §81. Mr X was not being assaultive at the time he was tasered and consequently, Officer C’s use of the Taser twice was a breach of Police policy. In addition, there were other, less violent, options available to the officers. For example, they could have continued communicating with Mr X or could have asked officers outside the cubicle for assistance.